Summer is just around the corner and that means it's time to incorporate some "summery" looks into our homes. Starting off with a nice summer arrangement on your coffee table or dining table can help you get in the mood for all the "beach-y" fun that summer brings. I want to show you how I created this summer vignette so that you can do the same in your home. 1. 3 clear glass hurricanes or vases (small, medium and large) wide enough to fit your hand in. 5. wood beads for filler. (you can also use sand or pebbles as filler for your hurricane lanterns. Fill your hurricane lanterns with whatever you choose. I filled mine with beaded curtain tie-backs that I no longer use for my curtains. I also used some broken pieces of coral in one of the hurricanes. You can use other materials as well. Just keep in mind to use things that remind you of summer. Now that you have your vases filled, you can pop in some battery-powered candles. I am obsessed with these LED pillar lights from Target! The flame flickers and moves like a real flame would! Placed inside a glass vessel makes the battery-operated candle look even more realistic! Also, they can be set to turn on at a certain time so you can come home from work and walk into a candle-lit home. Once you place your candles inside the hurricanes, you can arrange them on your tray. Next, add a layer of interest to your tray by framing the hurricane lamps with some decorative pieces. I used pieces of coral from my collection. Shells, small rocks or faux greenery would work too. Now you have a beautiful centerpiece to enjoy! It can go on your dining room table, coffee table, vanity, or really any flat surface in your home. I love small reminders of the changing seasons in my home. It's those small things that really make your home a joy to be in. This centerpiece can be used all year long in your home. 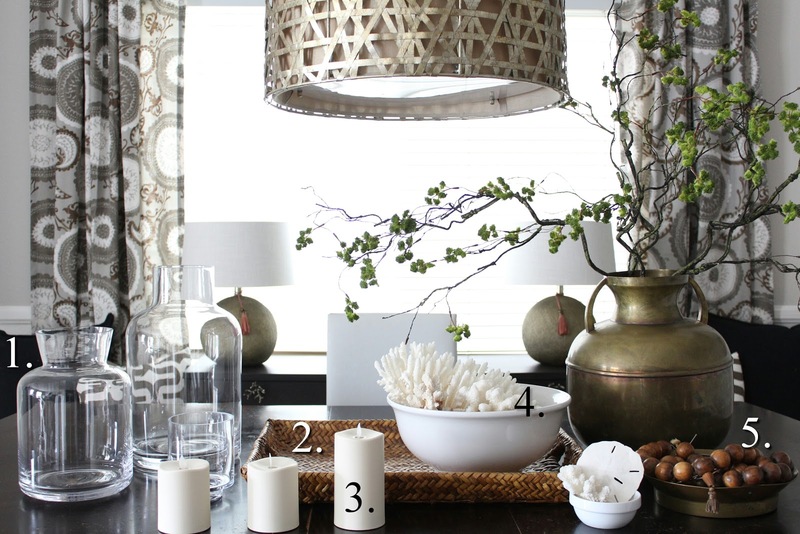 Simply change the vase filler and decorative objects to reflect the current season. Use small pumpkins for fall, sprigs of pine in the winter... you get the idea! Shop this arrangement by clicking below on anything you're interested in! Thanks for reading! If this is your first time visiting, don't forget to subscribe to my blog by adding your email! First, these are gorgeous and right up my alley. Second, how have I missed these wonderful decor pieces at Target?!?!? Looks like I'll be making another visit to get some soon!